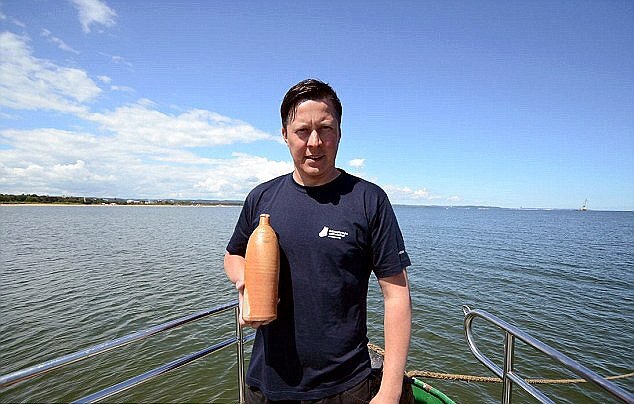 The world's oldest bottle of mineral water discovered on board a recovered shipwreck from the bottom of the Baltic Sea had been refilled with alcohol - and it's still perfectly safe to drink. The sealed 200-year-old 'Selters' water stoneware was found by researchers exploring the F-53-31 shipwreck in Gdańsk Bay, near the Polish coast in June. It was submitted for testing to uncover whether it contained original Selters water and preliminary analysis found it had a 14-per cent alcohol distillate – which could be vodka or gin diluted with water. Selters is a supplier of high-quality carbonated water, first discovered about 1,000 years ago in the Taunus Mountains area in Germany. It was one of the oldest types of mineral water in Europe, with many claiming that a few sips of the water, also known as 'fluid treasure', can boost strength and health. Tomasz Berdnarz, an underwater archaeologist from the National Maritime Museum, led the search on the shipwreck. He said: ‘The bottle dates back to the period of 1806 to 1830 and has been recovered during the works on the F-53-31 shipwreck, or the so-called Glazik – which means small rock in Polish’. The 12 inch (30cm) flask is believed to have been manufactured in Ranschbach, Germany - about 25 miles away from the Selters water spring. The bottle and its contents were sent to the J.S. Hamilton chemical laboratory in Gdynia, Poland at the beginning of July and the final results are expected to be completed early next month. Mr Berdnarz told Poland’s Ministry of Science and Science Education: ‘This means it would not cause poisoning. Apparently, however, it does not smell particularly good’. The springs of this mineral water went dry in the beginning of the 19th century and the characteristic stoneware bottles became rationed goods.